Over the last two years, Uranium Energy Corp. (NYSE AM: UEC) has taken advantage of the downturn and acquired uranium projects in the Powder River Basin of Wyoming, Canada’s Athabasca Basin, and Paraguay. “When prices are falling you can pull your horns in and sit on your hands, but we’ve been very active,” says Scott Melbye, UEC’s vice president corporate development. At the same time it was picking up new assets and consolidating land packages, it shut down its Palangana ISR mine and Hobson ISR processing plant in Texas, a strategy it says is prudent at a time when the uranium industry is so troubled. 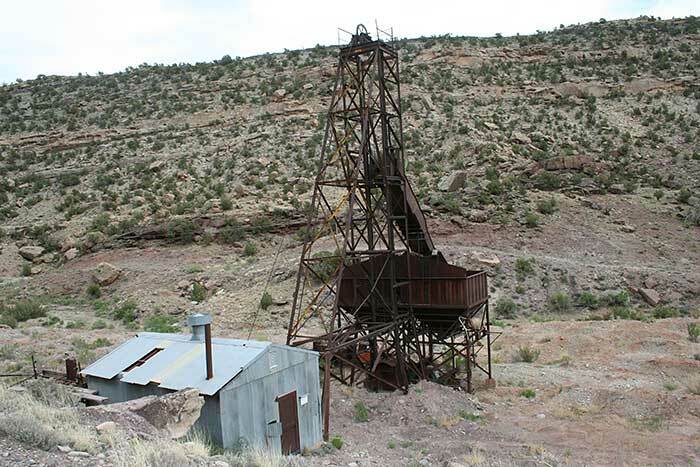 A historic headframe at Uranium Energy’s Slick Rock uranium project in Colorado. Credit: Uranium Energy. Now, he says, signs are beginning to emerge that a better market may be just around the corner, with production cuts at Cameco (TSX: CC; NYSE: CC) and in Kazakhstan helping to rebalance the industry after a seven-year bear market following the Fukushima nuclear disaster in Japan in 2011. Positive catalysts for the sector he says include a new procurement cycle for utilities, as many of the eight-to-ten year contracts that have met their needs since the last bull cycle are starting to roll-off. For now, many utilities in the U.S. are waiting to see what happens with the U.S. Department of Commerce’s Section 232 investigation into uranium imports.